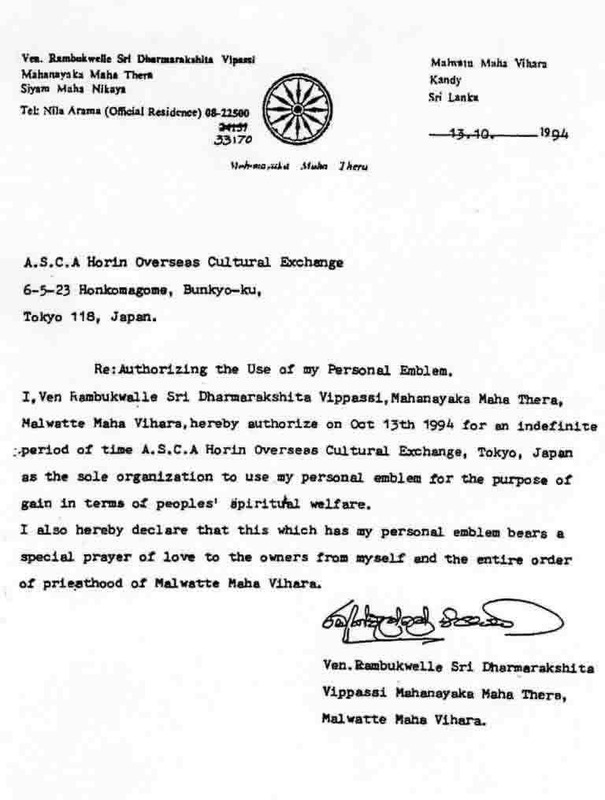 President Dr. Michiko Ito received in October, 1994 from the Most Venerable Rambukwelle Sri Dharmarakshita Vippassi Mahanayaka Maha Thero, Malwatte Maha Vihara in Kandy, Sri Lanka, a permanent permission to use his official personal emblem, “Horin” (Dhamma chakraya). At the occasion, the then A.S.C.A. Overseas Cultural Exchange changed its name to A.S.C.A. Horin Overseas Cultural Exchange. Therefore, the present organization, NPO ASCA Overseas Cultural Exchange, as well as its President Dr. Michiko Ito, under whom the above-mentioned organization has been established, has naturally succeeded the above-mentioned permission for an indefinite period of time.